Who is the greatest risk to our own security? The burglars or ourselves? 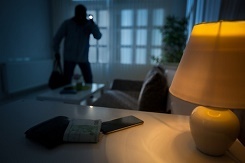 On this blog we usually talk about protecting yourself against burglars but how would you feel if we said that the greatest risk was not posed by burglars but you, yourself? While we would of course never suggest that anyone deserves to get burgled, it’s certainly the case that many people enable it to happen as a result of their own behaviour. Famous last words of people who don’t appreciate that a burglary happens in the UK every 40 seconds. While we don’t like to trade on fear here on the Calder Security blog, we do advocate a healthy dose of realism when it comes to home security because we have seen all too many times how complacency can create an open door for burglars – sometimes literally! Many people just don’t think that a burglar would be cheeky enough to try the door to see if it’s locked and that they wouldn’t attempt to come in if someone was in the house – wrong on both counts! If someone has the nerve to come into your house and steal your things, they are certainly ‘cheeky’ enough to see whether the door is locked. They can be in and out within minutes so you may not even be aware they’d been in until much later. Keep doors locked, even when you are at home. While you obviously have the right to leave your things wherever you want to in your own home, just be aware that if tempting items such as gadgets, jewellery, car keys and wallets/purses are left within easy sight from outside, it’s like a shop window to opportunist burglars. Any would-be intruder will weigh up potential reward over risk. If they can see exactly what they could get hold of before they even break in, it makes that decision much easier. Make sure valuables are out of sight. However prone you or the kids are to losing your key and locking yourself out, it is never a good idea to hide a spare key outside the house somewhere. Burglars will often have a good scout around to see if a key has been hidden anywhere. Also, you never know who is watching when you place or retrieve a key from your ‘hiding place’; they could easily come back later and use it themselves. If you need to keep a spare key outside the home, then leave one with a trusted neighbour or friend. Alternatively install a key safe. Most burglars would rather break in when there’s nobody home, especially if the house is going to be empty for a prolonged period. Telling people that you’re away on holiday on social media, leaving notes for the postman or the milkman or even just telling people in the pub or down the shops is not a smart move. Only tell those you trust when you’re not going to be at home. You would be surprised to know how many people have a burglar alarm installed but don’t actually bother to set it. It might be laziness, forgetfulness or a more practical problem such as having forgotten the code or the alarm being faulty. “How would the burglar know?” you might say. Well, they may watch as you go in and out to see if you stop to set or unset an alarm or listen out for the beeps. They may even just try their luck with a plan to simply run away if the alarm is triggered. If it’s not, they will usually proceed. Always set the alarm and if it’s not working, get it serviced or repaired. Wired or Wireless – which is the Best Burglar Alarm System? Paying attention to all of these areas is relatively easy and, for the most part, cost free. Trust us when we say that one of the most upsetting parts about a break in is knowing that you could have easily prevented it. Kicking yourself after the event will not replace that favourite item of jewellery, safeguard the personal e-mails and social media accounts on a stolen laptop or wipe away the feeling of intrusion and violation that comes with a break in. Burglars are enemy enough, don’t be complicit in their crimes against you.